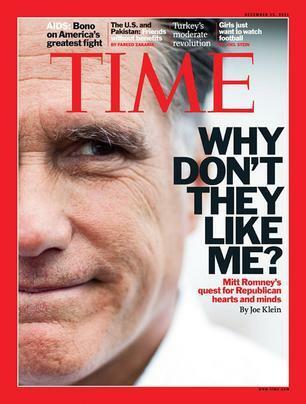 Next to a grimacing close-up of presidential candidate Mitt Romney's face, the latest cover of Time magazine asks, "Why Don't They Like Me?" The five-page article by Joe Klein in the news magazine's Dec. 12 edition (available online to subscribers only) attempts to answer the question of why many Republicans appear to want anybody but Romney as their party's nominee. Klein labeled the two-time White House contender "uninspiring to moderates and untrustworthy to conservatives, an unloved, forlorn front runner" who maintains the support of only about 20 percent of the GOP.